A performance exploring copyright lawbs impact on artists, the culture of celebrity, and the commodification of the art object. The piece is presented in public spaces, usually associated with a performance festival or exhibition. In 2007 celebrity heiress Paris Hilton trademarked her personal catch-phrase "That's Hot!" with the US Patents Office. This was not the first time an individual had been granted exclusive legal rights to use a phrase. But Hilton's case was the mostB famous to date because of the nature of her celebrity (being famous for nothing otherB than being famous) and the commonality of the phrase she chose to trademark. Since then, Hilton has licensed the phrase for use on clothing, electronic devices, and alcoholic beverages. She has also engaged in lawsuit against the Hallmark greeting card company for using the phrase on one of its products. The concept of the performance is that I would transform myself into a "Celebrity Artist" by following in Hiltonbs footsteps. 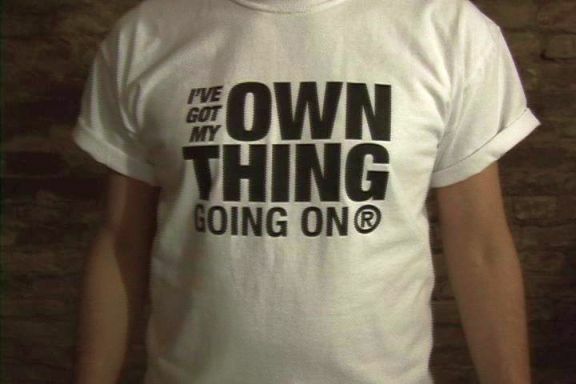 The process began with me registering a trademark with the Canadian Intellectual Property Office for the phrase "I've Got My Own Thing Going On". When the process was complete I became the legal ownerB of the phrase in Canada. 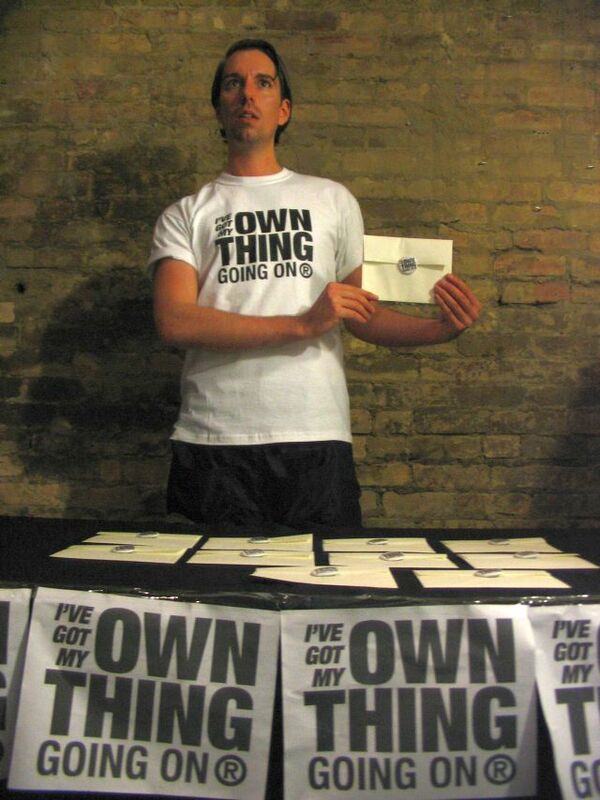 For the performance I set up a table in public spaces withB buttons and t-shirts emblazoned with the phrase that were available for purchase. Though the items were mass-produced at a printing house, each one came with an individually numbered certificate of authenticity; a means of transforming the mass-produced objects into "Fine Art Multiplies", suggesting they would appreciate in value over time. The items also came with a copy of my trademark registration and a pamphlet with usage and legal guidelines. During the performance I interacted with viewers, promoting myself as a "Celebrity Artist", giving them information about my catch-phrase, and encouraging them to use it in everyday conversation, while following the legal restrictions imposed on them by my ownership of the phrase. I also engaged in a free-form discussion with viewers about intellectual property law and its impact on artists working today. Each version of the performance would terminate when the viewer agreed to buy a piece of my merchandise. Though it was not something I had initially set out to explore, the performance also became an exploration of creating art in a capitalist culture. The viewer choosing to buy one of my buttons or t-shirts was not just about them wanting to own one of these objects. It was also about them buying into my status as a "Celebrity Artist". Chris Dupuis (Toronto, 1978) is an artist working with performance, video, and text. His work has been presented widely at galleries and festivals across Europe, North America, and East Asia. He holds a BFA in Theatre from York University (Toronto, Canada) and is currently a research fellow at the A.PASS Research Residency.